The company released a statement on Saturday morning, saying its systems were now working at "full capacity". 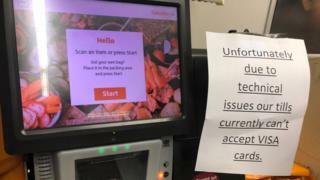 Visa apologised and said Friday's outage was not down to "unauthorised access or a cyber attack". Customers have reported money going missing from accounts when their cards were declined - including one man who lost £10,000 when paying for a car. Tom Mitchell, from Kent, said the money left his Natwest account, but his bank told him it was up to Visa to complete the transaction - instead, his money has been left in "limbo". The 33-year-old said: "I live in Kent and went to Ipswich to get this car. It took four hours by train. "I woke up a few times in the night to check my bank balance so there is a bit of a worry there... and I haven't heard anything today." Payments processed through Visa's systems account for £1 in £3 of all UK spending. Shoppers were stuck in queues, diners were left embarrassed and one MP even drove away from a petrol station without paying as the issue affected Visa Europe's systems on Friday. "[The] cashier obviously didn't know what was happening," he said. "We said, 'there's plenty of money in there' [and] couldn't understand it. "We got the receipts and... I went outside, checked my balance and the balance had actually gone down by the amount I should have paid." And Sarah Brown, from London, had her card declined three times when she was buying a £358 jacket and now has three pending transactions on her HSBC account - totalling £1,074. The 47-year-old now has to go back to the store and go through the transactions, which she said was a "massive inconvenience". "My card just wouldn't go through," the 32-year-old told the BBC. "I didn't have cash on me so I had to drive all the way home." On Friday, Visa said the system was "close to normal" five hours after publicly acknowledging the problem. The company's chief executive, Al Kelly, apologised for the trouble caused by the hardware failure. "Our goal is to ensure all Visa payments work reliably 24 hours a day, 365 days a year," he said. "We fell well short of this goal today and we apologise to all of our partners and Visa account holders for any inconvenience this may have caused."